Find out more about Jimmy’s life! 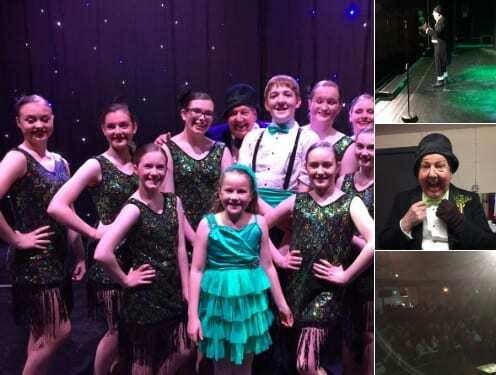 Northern Irish comedian Jimmy Cricket celebrated St Patrick’s Day in style. The popular entertainer performed one of his Great Value for a Tenner comedy shows at the Royal Court Theatre in Bacup, Lancashire, on Sunday. The Royal Court Theatre was the venue nine years ago for the recording of his first DVD, Jimmy Cricket Live – Pull Your Seats Forward. It can only be bought via the Go Shopping page on this website or at one of Jimmy’s live shows. St Patrick’s Day, also known as the Feast of St Patrick, is a religious and cultural celebration held on 17 March, the traditional death date of St Patrick, the foremost patron saint of Ireland. Interviewed by cousin on Black Country Radio about Christmas CD! Jimmy Cricket was interviewed on the radio by a relative recently! The Northern Irish comedian chatted to his cousin Pat Breslin, who as well as being a professional entertainer himself, is a presenter on Black Country Radio, which broadcasts across part of the West Midlands. Jimmy was asked about his Christmas CD, Santa bring my wellies back to me, which first went on sale two years ago and has now sold around 1600 copies. The interview with Jimmy begins at 2:05:20; towards the top of the page on the link above, press the play button (arrow pointing right) and then drag the white circle along the black band to this time. Famous funnyman Jimmy said that when another 400 copies of the CD have been sold, it will have raised £10,000 for the hospice. 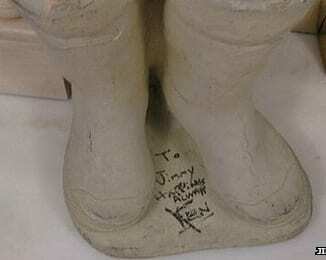 The name of the CD relates to the theft several years ago of concrete wellington boots (below right) given to Rochdale-based Jimmy by friend and fellow comedian, the late Sir Ken Dodd. They were never recovered. All proceeds go to Francis House Children’s Hospice which is based in south Manchester and is a favourite charity of Jimmy’s. In a special offer only for Christmas 2018, Jimmy is offering his Christmas CD and his DVD Pull Your Seats Forward, which is based on a live performance, both for the same price (£12 including P&P) and Jimmy will send half the money to charity. For more details about this special offer, go here. Sales of Jimmy Cricket’s first live DVD are approaching 8,000. 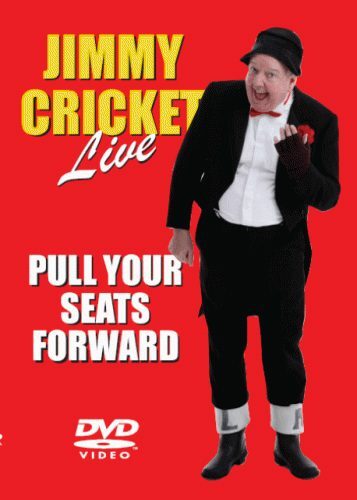 Jimmy Cricket Live – Pull Your Seats Forward was created by the famous comedian’s family company, Wellie Boot Productions, in 2010. Belfast-born Jimmy produced the DVD in response to the overwhelming public clamour that suggested there was a real demand for a recording of his stand-up entertainment. It was filmed at the Royal Court Theatre in Bacup, Lancashire, near Jimmy’s adopted home of Rochdale in Greater Manchester. The DVD is an hour and 10 minutes long and includes Jimmy’s favourite routines, a phone call and letter from his mammy, his famous Leaving Home poem, his sentimental ballad called I’m Dreaming of a Far off Land and 20 minutes of extras. The sales figure is particularly impressive as the DVD is not available in retail outlets: it can only be bought via the Go Shopping page on this website or at one of his live shows. Above is an edited version of a trailer of Jimmy Cricket live at the Royal Court Theatre in Bacup. Journalist and Cricket Times editor Martin Hamer asks Jimmy all about the show in an interview which includes exclusive excerpts from the DVD. The full longer version of the interview can be viewed below. Jimmy Cricket and his wellies had them laughing in the Valleys recently. The famous Irish comedian performed at Pontypool Park in Pontypool, south Wales, in mid-August. 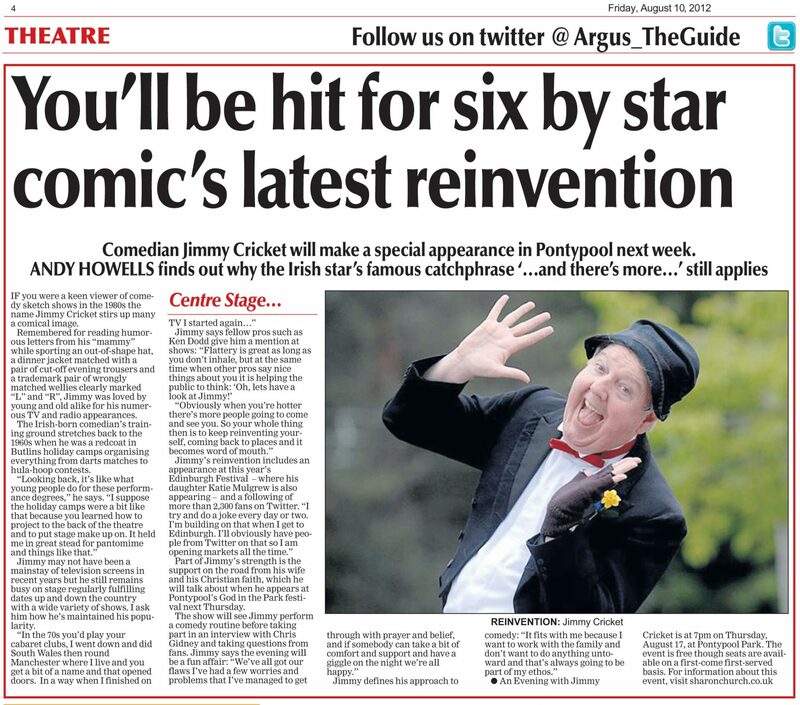 A feature all about Jimmy and his successful showbiz career appeared in the South Wales Argus a week before the show. The newspaper article began… If you were a keen viewer of comedy sketch shows in the 1980s, the name Jimmy Cricket stirs up many a comical image. Remembered for reading humorous letters from his “mammy” while sporting an out-of-shape hat, a dinner jacket matched with a pair of cut-off evening trousers and a trademark pair of wrongly matched wellies clearly marked “L” and “R”, Jimmy was loved by young and old alike for his numerous TV and radio appearances. The Irish-born comedian’s training ground stretches back to the 1960s when he was a redcoat in Butlins holiday camps organising everything from darts matches to hula-hoop contests. “Looking back, it’s like what young people do for these performance degrees,” he says. 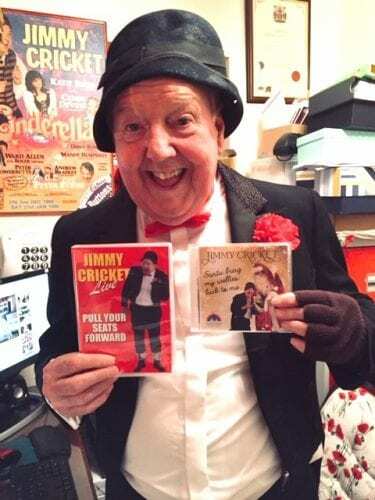 Irish comedian Jimmy Cricket is celebrating another milestone with sales of his first live DVD. More than 3,000 copies of “Jimmy Cricket Live – Pull Your Seats Forward” have now been sold. The DVD was created by Jimmy’s small company, Wellie Boot Productions, a couple of years ago. The DVD is an hour and 10 minutes long and includes Jimmy’s favourite routines, a phone call and letter from his mammy, his famous “Leaving Home” poem, his sentimental ballad called “I’m Dreaming of a Far off Land” and 20 minutes of extras. Jimmy said he was especially pleased about reaching 3,000 based on the fact that the DVD is not available in retail outlets: it can only be bought via the Go Shopping page on this website (where you can purchase all Jimmy’s merchandise) or at one of his live performances. “I am thrilled I have reached this milestone after such a short selling period,” said Jimmy. “It proves I am filling a gap in the market. “To reach 3,000 sales is truly a significant achievement to celebrate. This DVD is something I am very proud of. “I have also had good feedback from those who have purchased it. This always pleases me, as I set out with an aim to create a high-quality comedy product which was suitable for all the family. My next neighbour has had a barney with the Inland Revenue because they wont let him claim for his toupee. They say it's a luxury item. He says it's an overhead expense!